Joshua Vissers/Daily Mining Gazette Lydia Lytle, a physical therapist with Aspirus, talks through the steps of getting out of bed safely to prevent falls. CALUMET — “I’m a faller,” Julie Sweitz of Hancock said. She’s fallen more than half a dozen times, sometimes tripping or stumbling over an edge, something on the floor or during an activity like bowling. With one total-knee replacement and problems developing in the other knee now, walking is painful for her. The most recent time Sweitz fell, just a few weeks ago, was different than the others. “There was nothing there,” she said. She simply fell for no clear reason, hitting her head on the radiator and causing a lot of bleeding from her scalp. This is exactly the situation employees of Aspirus Care Network work to avoid by hosting a seminar aimed at helping senior citizens avoid falls. Their most recent seminar was held Tuesday night at the Siskiwit Reception Hall in Calumet. “Falls are preventable,” said Marlys Folly, trauma coordinator at Aspirus Keweenaw. According to statistics from Aspirus Keweenaw Hospital, more than half of their trauma patients over the age of 42 are admitted because of “same-level falls,” falls on a level surface. More than half of those falls occur at home. That is exactly what happened to Sweitz, part of what brought her to Calumet Tuesday. Folly told attendees that many of these falls can be prevented by simple things like turning lights on at night, wearing better footwear and having regular vision and hearing checks. Another option is checking with a pharmacist about risk of falls associated with any current medications. “Many medications can increase your risk of falling,” Folly said. Blood pressure medications, in particular, can contribute to falls that happen as someone stands up from a chair or the bed. One thing Folly advised against is limiting activity or staying home. “This leads to depression,” she said. In fact, several exercises and stretches can help prevent falls, and make it easier to sit, stand and walk, too. 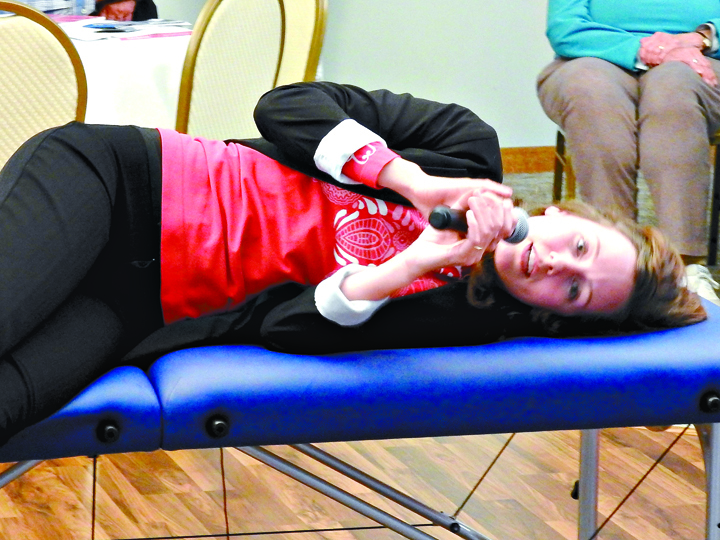 Lydia Lytle, a physical therapist who works with Aspirus, demonstrated several of these like seated leg lifts, heel-to-toe raises and side-stepping, all with the use of support like a chair or countertop to ensure stability. “Use a countertop if you can,” she said. People who think they could benefit from this type of exercise can call the Calumet or Houghton Aspirus Clinics and schedule a free, 15-minute consultation with a physical therapist. If it looks like they would benefit from further physical therapy, they won’t have to schedule another visit with their regular doctor. “We will get the referral from your doctor,” Lytle said. Lytle also showed some ways to lessen the impact of a fall if it happens. “It is safer for you to bend your knees before you fall,” she said. Bending the knees, going limp, and protecting your face and head with bent arms rather than straight arms can help prevent wrist and head injuries, as well as reduce the impact on the rest of the body.